Caricature of Dr. J. Allen Hyneck in classic comic book style. 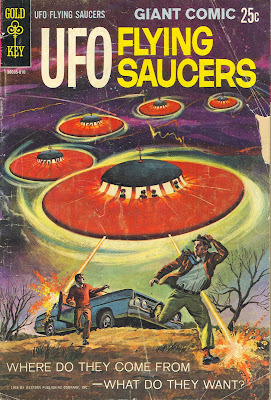 This image is from an amazing series of comic books succinctly titled UFO FLYING SAUCERS. 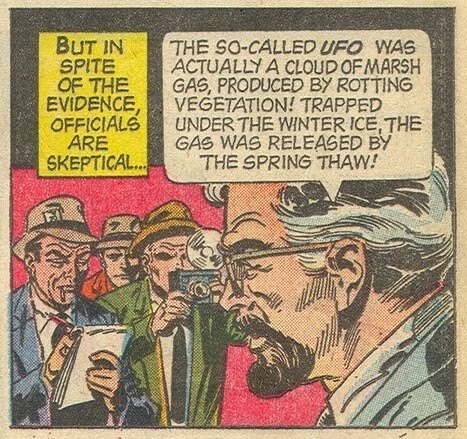 The content is nothing more than the key cases from the UFO literature, with each incident rendered out in a short sequence of traditional illustrated frames. The series began in 1968 (the year of 2001: A SPACE ODYSSEY) and ended in 1977 (the year of CLOSE ENCOUNTERS OF THE THIRD KIND). There is something beautiful to the work-a-day craftsmanship of these comic books. Looking at these pages, it saddens me that there ain't really nuthin' new to the way we look at the overall story. No answers, just unanswered questions. Huge thanks to Christopher Knowles at THE SECRET SUN for turning me on to these quintessential images from a long gone era. Oh how Mac Tonnies would have LOVED these classic images. As a kid, I desperately wanted to draw stuff just like this! The questions are the answers! Space-o-delic numinosity in junk culture garb at its finest! Is anyone else thinks a bit weird the matching of that "war of the worlds" image, with the title "where do they come from, what do they want?"?? --"Oh I surely wish those saucers stopped trying to disintegrate us so we could ask them about their place of origin and traveling intentions..."